Leclerc is 7-5 in races and 10-3 in qualifying against Ericsson, ericsson! Gasly got 10 points in past 3 races (Hungary/Spa) while Leclerc hasn't scored a single point in past 5 races, Ericsson has scored points in 2 out of past 5 races. Disregarding the mayhem of Azer Charles has only scored 5 points the entire season, ericsson has 8. Charles has scored points in 5 races, Ericsson 4. I highly doubt hes the new Max/Hamilton like he is made out to be here. Sauber is getting beaten by Force India/McLaren and Toro Rosso with a Honda engine, only Williams is behind. I have to applaud your belief if you think that he can come straight to Ferrari, lead the team to victory and beat Vettel and Hamilton. Hamilton is far more dominant against Bottas and as much you seem to respect Ericssons ability I would argue Bottas is still a step ahead. And what is Kimis score against "overrated, nothing special, mistake prone, hotheaded" Vettel? He is what, 11-2 in qualifying and with all his mistakes and crashes comfortably ahead in pts? He also has what, 5 wins this year against how many Kimi's? Is it 0 in 5 years? Thats the thing. Our driver lineup is dissapointing. For all his speed, Vettel is mistake prone and Kimi is just absolutely lackluster. He has no pace to win on merit, he can't fight against Hamilton, never could. As soon as he was 1st, you could have sensed it was over. Kimi is no race winner at this age, and I want to try with Leclerc. He had also **** luck past few weekends (Spa crash not his fault at all). But yea, lets go for Kimi in his 6th year after not winning single race for 5 before. Agreed.. Ricciardo and Leclerc would be such a strong line up. Seb is good but is very mistake prone and has already given the title to goldenboy this season when we could have had it and Kimi is okay but line past his sell-by date. I swear if they sign Kimi for 2019 I'll be gutted. I rather agree.. Kimi seems to go backwards from his grid position at the start of most races. He's only started to pull finger with the Leclerc stories in the air, IMHO. To be fair, we pitted Kimi a bit early and his tires got destroyed towards the end. However, Seb would've made a significantly bigger gap to Hamilton before his tires go AWOL. I agree completely, and "calculative" is the perfect word to describe the trait Vettel seems to be missing. Alonso has it, and I begrudgingly have to admit Hamilton has it to a lesser degree. Vettel is a great driver, but he seems to think races are won in the first two or three turns. Whatever is going on privately in the team isn't helping either. He's got enough to deal with racing Hamilton. He doesn't need to be second guessing his own team's decisions. I really hope him and the team can still pull out both championships. There are a lot of points left, but it's not going to be easy. He's going to need to win a bunch of poles, control from the front, and Hamilton to have some bad luck. Mercedes already had a rare double DNF. Lets hope Vettel can capitalize if they're new engine isn't bullet proof. So according to Autobild, it all started during the Canadian GP. Marchionne wanted Leclerc after that woman accused Kimi. Leclerc was supposed to be in Ferrari already in Spa. Autobild found out that Puma produced 4 race overalls for Charles. Lawyers met with Nicholas Todt. [Autobild] Weeks after lawyers met with Nicholas Todt and the contract was made, Marchionne went to the hospital and died due to complications.. Now Kimi supporters such as Arrivabene, Vettel, Camilleri and Elkann want to keep Kimi. [Autobild] Leclerc also has strong supporters like Jean Todt and Nicholas Todt. And Ferrari does not want to go against them. Mattia Binotto is also pro-Leclerc apparently. [Autobild] Ferrari is currently in a dilemma. They don‘t want to lose their junior but also don‘t want to give him their red goddess yet. So they want to buy him out of his contract now and want to make the contract available for 2020. Insiders think that this is going to happen. 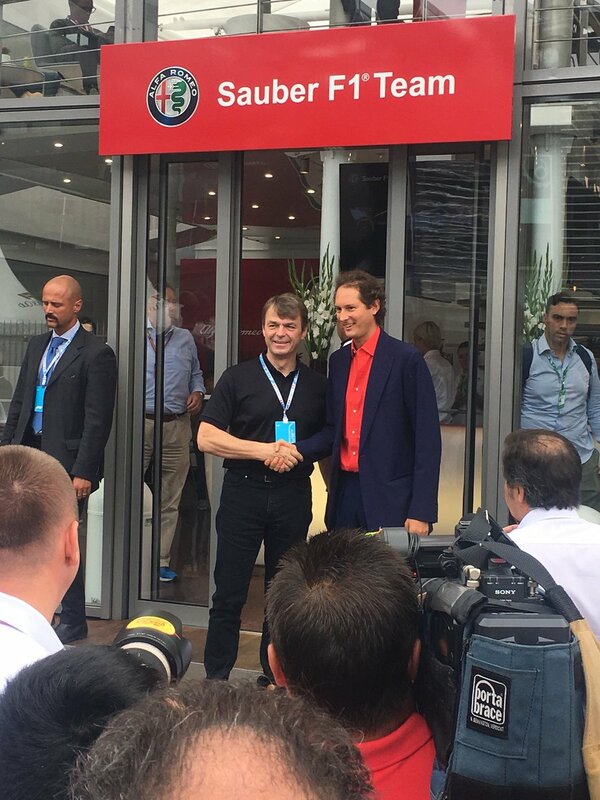 Today @ Monza (09-02-18)-->Ferrari chairman John Elkann has met with Sauber for the second time. Meeting with Vasseur. And the lawyer has been here since Friday. That lawyer is only seen when it comes to contracts. Charles Leclerc knows where he will drive and he is not happy but extremely happy. Sergio Marchionne is responsible for getting Ferrari to where they are now. He made all the necessary choices and developed the team. If we want to have any hope for a WCC or WDC, we need a change. Vettel is too comfortable with Raikkonen, who hasn't won a single race in last 5 years and isn't able to take points off Hamilton even starting from pole. Not to mention his countless mistakes in Q3 and losing places at the start. SM told him to wake the **** up for years to no effect. Ferrari would do themselves a big favor by announcing to whatever is going to happen as soon as possible. Marchionne wanted Leclerc for 2019 and Ferrari should respect his decision. Nice!, kimi cant take points off Ham to save his life, even if leclerc utterly fails, this set of drivers just isnt working either. Maybe we should swap Vettel with Verstappen. I mean you constantly post articles about Horner and how much he loves Vettel, I am sure he wouldn't mind. Last edited by tifosi1993; 4th September 2018 at 07:35. I think someday he will drive for Scuderia Ferrari. probably when he's 40 years old and way past his best. "Lewis, an epic fight with Kimi. Would you miss him from the grid if he won’t be with us next year? LH: Would I miss Kimi? I think it’s always a difficult question to say if you miss someone. I think the sport would naturally miss him, yeah. I made it no secret that before I even got to Formula One I was always playing… when I was playing the Playstation I was always Kimi in the McLaren, imagining that was me. And then I remember the first car at McLaren which was Kimi’s set-up and the suspension that he would use, which was… I remember it like it was yesterday. It was an amazing experience and it was cool because I think our driving style was kinda similar, which meant that I ended up being quite comfortable with the set-up that he used back then. So, y’know, he’s had an incredible career and it’s been a real honour to race against a great Finn such as him – but he looks like he’s just ice-cold. He’s just got plenty of years left in him. He’s not seeming to age. I don’t know what it is about Finnish people. I think it’s the sauna and the ice thing. Yeah." My God has it been that long? You know you are old when the current 33 year old world champ, was playing you on the playstation when he was a teenager. Last edited by IulianFerrari; 4th September 2018 at 09:07. LeClerc to Ferrari announcement Thursday. Reported 2 million a year. I don't know if that's Euro's or USD. Definitely way cheaper than Kimi....fair enough. Max will have a "Honda performance clause" in his contract IF Honda does'nt perform in 2019.......along with if Vettel keeps "making mistakes"....then it's a very good possibility Ferrari picks up Max. Ferrari's engineers and aerodynamacists have delivered a competitive car for 2018 to take on Mercedes along with the reliability (quality control) so far. So we can say after Monza...that it's not the whole package of the car that's the problem. The car is exposing what's wrong with Ferrari......track by track in small increments.....those small increments will most likely add up to a big increment in points. When going against Mercedes......Ferrari cannot be making these incremental mistakes however small or big they may be. KR's 2018 salary allegedly is 7 million + possible bonuses. yes Ed, that's what I have heard as well. Well I guess this is farewell for Kimi. Honestly I have no idea if it's good or bad for the team. I have nothing against Leclerc but for me at this moment he hasn't proven anything so far. Only time will tell if it was a good or a bad decision. I think the drivers already know who will partner Seb next year. We know how Kimi loves to gossip with the media and how chatty he is in general, so we wont get anything from him and Charles is probably to afraid to say anything that might get him in trouble. We will just have to wait until the official announcement I guess, which is probably presenting Leclerc this week. I think vettel never asked kimi’s help...kimi never matched vettel’s race pace 2015-till date. On lap pace, occasionally kimi was faster than vettel. Kimi is good over one lap but somehow finds it difficult to maintain speed throughout an entire grand prix. I wonder why that is, could be his age. Replace KR with [insert any name here] and everything will get soooo much better. However, we don't know what that performance clause is. What if Red Bull simply holds on to their status quo which is third best team? Is that enough to release Max from the contract? I think Red Bull will still be better than Renault as Honda has shown they finally upped their game and stabilized their reliability. I think Honda and Renault are pretty equal when it comes to engine power with Renault having a slight advantage. But add the superior RB chassis here and you get a more powerful Red Bull than Renault. Red Bull are not McLaren they said it themselves that they'll let Honda make the engine and they'll successfully adapt their chassis to their engine where McLaren did the opposite, they made Honda adapt their engine to their chassis. And McLaren doesn't have quite the superior chassis as they claimed numerous times in the past. Last edited by Stormy; 4th September 2018 at 13:53. Until [insert any name here] starts racing, then [insert any name here] has to be replaced and everything will get soooo much better. That is if we don't go back to the old but never boring " Sack'em all !"